In patients with aortic aneurysm, aortic dissection is the most feared catastrophic event. Rupture of a thoracic aortic aneurysm is more frequent than abdominal aortic rupture. Thus, high clinical suspicion is required, and time is of the essence. Imaging techniques, including MRI, TEE, or CT scanning, should be quickly utilized. Although aortic dissection may be suspected on the basis of history and physical examination findings, diagnostic imaging is necessary to establish the diagnosis. A clear and efficient imaging strategy is required. The clinical team involved in the diagnosis and treatment of patients with aortic dissection should prospectively agree on a strategy. In developing an approach, consideration should be given to the technology available at the institution and the ease of performing each test, especially after hours. Many thoracic aneurysms are readily visible on chest radiographs. Characteristic findings are widening of the mediastinal silhouette, enlargement of the aortic knob, or displacement of the trachea from the midline. 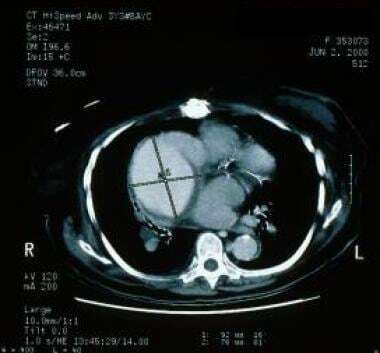 Lateral films demonstrate loss of the retrosternal air space, but the aneurysms may be completely obscured by the heart, and the chest radiograph may therefore appear normal. Aortic calcification may outline the borders of the aneurysm in the anterior, posterior, and lateral views in both the chest and abdomen. Because of the proximity of the esophagus to the aorta, higher transducer frequencies with TEE may be used to better delineate the aorta. TEE is highly sensitive but less specific, and it is excellent at detecting pericardial effusion and aortic regurgitation. 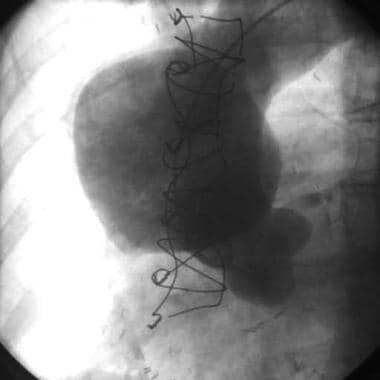 TEE may be quickly performed at the patient's bedside with the patient under sedation; it does not expose the patient to radiation, nor is the injection of contrast material necessary. However, it may be difficult to evaluate the ascending aorta and the proximal arch with TEE. TTE is not accurate for diagnosing thoracic aneurysms, and it is particularly limited in its ability to examine the descending thoracic aorta. It may help detect aortic insufficiency and aneurysms of the sinus of Valsalva. TEE is a far more accurate method for assessing the thoracic aorta and has become widely used for detection of aortic dissection. There has been less experience with TEE, however, in the evaluation of nondissecting thoracic aneurysms. TEE images show the aortic valve, ascending aorta, and descending thoracic aorta, but they are limited in the area of the distal ascending aorta, transverse aortic arch, and upper abdominal aorta. Infrarenal abdominal aortic aneurysms may be visualized by means of ultrasonography, but these images do not help define the extent of thoracoabdominal aortic aneurysms. Acute myocardial infarction and pneumothorax are included in the differential diagnosis. Other conditions to be considered are acute coronary syndrome, pulmonary embolism, acute pericarditis, pericardial effusion or tamponade, new aortic regurgitation, penetrating aortic ulcer, aortic intramural hemorrhage, esophageal rupture, and musculoskeletal and/or spinal conditions. Chest radiograph showing widening of the superior mediastinum. Computed tomography scan depicting a descending thoracic aortic aneurysm with mural thrombus at the level of the left atrium. Thoracic aneurysms are classified in accordance with the portion of aorta involved: the ascending thoracic aorta, the arch, or the descending thoracic aorta. This anatomic distinction is important because the etiology, natural history, and treatment of thoracic aneurysms vary for each of these segments. The aortic layers, beginning at the innermost wall, are the intima, the media, and the adventitia. In aortic dissection, a tear in the intima allows blood to escape from the true lumen of the aorta. The inner layer of the media is rapidly dissected from the outer layer, and blood causes the aorta to rapidly expand above normal size. A false channel forms in the outer half of the aortic media, whose walls are exceedingly thin and are highly susceptible to rupture. Size is an important predictor of the risk of aneurysm rupture. Chronic dissections are generally diagnosed 2 weeks after the initial tear and may expand in the weakened aortic wall to develop an aneurysm. Many thoracic aneurysms are readily visible on chest radiographs. Characteristic findings are (1) widening of the mediastinal silhouette, (2) enlargement of the aortic knob, or (3) displacement of the trachea from the midline (see the first image below). Lateral films demonstrate loss of the retrosternal air space, but the aneurysms may be completely obscured by the heart, and the chest radiograph may therefore appear normal. Aortic calcification may outline the borders of the aneurysm in the anterior, posterior, and lateral views in both the chest and abdomen. 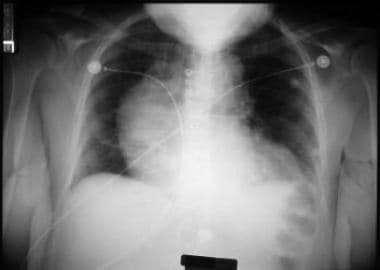 Chest radiograph in a patient with a thoracic aortic aneurysm following aneurysm surgery. Chest radiographs display abnormalities in 80-90% of patients, but the abnormalities are nonspecific. For example, mediastinal widening occurs in more than 75% of cases and may occur in the ascending aorta, the aortic arch, or the descending portion of the thoracic aorta. This finding may be difficult to differentiate from the aortic tortuosity that is associated with long-standing hypertension. The calcium sign is a rare radiographic finding in aortic dissection (AD). Generally, intimal calcification is seen along the outer border of the aorta. With dissection of the aortic media, the calcium deposit becomes separated from the outermost portion of the aorta by more than 0.5 cm. 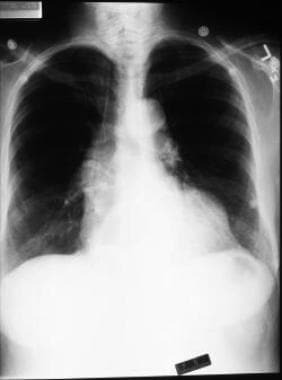 Other radiographic signs include a double-opacity appearance of the aorta, with the suggestion of true and false channels; a localized bulge along a normally smooth aortic contour; a disparity in the caliber between the descending and ascending aorta; obliteration of the aortic knob; and displacement of the trachea to the right by the dissection. 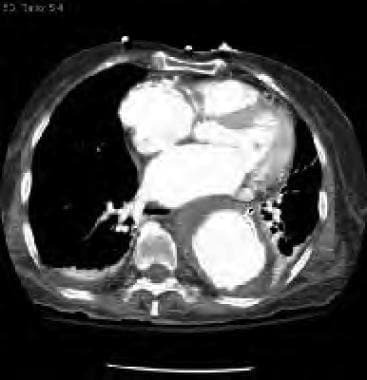 Computed tomography scan from a patient whose ascending aortogram showed an ascending aortic aneurysm. MRI and CT scanning are the modalities most frequently used for diagnosing and monitoring thoracic aortic diseases. [5, 6] A number of reports attest to the effectiveness of MRI for the evaluation of both true and false aortic aneurysms. Velocity-encoded cine MRI provides a measurement of the differential flow velocity in the true and false channels. By using multiple images per cardiac cycle, a velocity-time curve may be generated to display the disparate flow pattern in the 2 channels. Because MRI and MRA are noninvasive and provide images along both the short and long axes of the thoracic aorta, they are the preferred method for the follow-up of patients with thoracic aortic diseases. MRA in the sagittal plane is effective for depicting the origins of the arch branches and visceral arteries of the abdominal aorta and their relationship to the aneurysm. MRI and MRA are used to monitor the maximum diameter and extent of the thoracic aortic aneurysm. A maximum diameter exceeding 6 cm indicates the need for surgical repair. Regular monitoring is important for patients with Marfan syndrome and other conditions associated with progressive aortic dilatation. Velocity-encoded cine MRI may be used to quantify the volume of concomitant aortic regurgitation in patients with aortoannular abnormalities. Gadolinium-containing contrast material administered by IV may be valuable in the full eveluation of aortic pathology. However, gadolinium-based contrast agents have been linked to the development of nephrogenic systemic fibrosis (NSF) or nephrogenic fibrosing dermopathy (NFD). For more information, see the eMedicine topic Nephrogenic Systemic Fibrosis. The disease has occurred in patients with moderate to end-stage renal disease after being given a gadolinium-based contrast agent to enhance MRI or MRA scans. NSF/NFD is a debilitating and sometimes fatal disease. Characteristics include red or dark patches on the skin; burning, itching, swelling, hardening, and tightening of the skin; yellow spots on the whites of the eyes; joint stiffness with trouble moving or straightening the arms, hands, legs, or feet; pain deep in the hip bones or ribs; and muscle weakness. For more information, see the FDA Public Health Advisory or Medscape. Transesophageal echocardiography (TEE) provides an assessment of cardiac structure and function and is highly sensitive in the diagnosis of aortic pathologies. [14, 15, 16, 17] The accuracy of TEE in imaging intimal membranes for signs of aortic dissection has been reported to be 90%. Intraoperatively, TEE may be used to monitor cardiac function; detect atherosclerosis in the thoracic aorta; establish the competency of the aortic valve before surgery; and lower the incidence of stroke, by enabling surgeons to better navigate the placement of clamps and to avoid loosening any atherosclerotic plaques, which could otherwise cause brain embolism. TEE poorly depicts aneurysms below the diaphragm and in the transverse aortic arch. In addition, this modality requires a skilled cardiologist to interpret the study data, because a high rate of false-positive results has been observed with those who are unfamiliar with the diagnostic limitations of TEE. The findings of aortic dissection seen at angiography include the following: (1) filling of a false channel with or without an intervening intimal flap, (2) distortion of the true lumen by either a patent or a thrombosed false lumen, (3) thickening of the aortic wall by more than 0.5 cm from a thrombosed false lumen, and (4) displaced intimal calcification. Aortography is accurate for determining the site of the intimal tear and the extent of the dissection (see the first image below). Aortic regurgitation is also easily demonstrated with aortography; this modality demonstrates the extent and location of dissection into aortic side branches. Ascending aortogram showing ascending aortic aneurysm. The patient also underwent computed tomography scanning. Generally, patients electively undergo aortography. It is used in the assessment of operative risks and in deciding on possible modifications of operative technique. The aortogram depicts aortic root dilatation and clearly defines the geography of the aorta and the condition of the smaller vessels. Absolute indications for aortography include renovascular hypertension, intermittent claudication, atherosclerotic occlusive abdominal aorta, and symptoms of carotid stenosis. Aortography is highly specific, but it is an invasive procedure and increases the risk of renal failure because of the use of radiopaque dyes. [Guideline] Expert Panel on Vascular Imaging:., Bennett SJ, Dill KE, Hanley M, Ahmed O, Desjardins B, et al. ACR Appropriateness Criteria: Suspected Thoracic Aortic Aneurysm. J Am Coll Radiol. 2018 May. 15 (5S):S208-S214. [Medline]. [Full Text]. Crimi E, Lee JT, Dake MD, van der Starre PJ. Transesophageal echocardiography guidance for stent-graft repair of a thoracic aneurysm is facilitated by the ability of partial stent deployment. Ann Vasc Surg. 2012 Aug. 26(6):861.e7-9. [Medline]. Lin MP, Chang SC, Wu RH, Chou CK, Tzeng WS. A comparison of computed tomography, magnetic resonance imaging, and digital subtraction angiography findings in the diagnosis of infected aortic aneurysm. J Comput Assist Tomogr. 2008 Jul-Aug. 32(4):616-20. [Medline]. Miller WT. Thoracic aortic aneurysms: plain film findings. Semin Roentgenol. 2001 Oct. 36(4):288-94. Callaghan FM, Karkouri J, Broadhouse K, Evin M, Fletcher DF, Grieve SM. Thoracic aortic aneurysm: 4D flow MRI and computational fluid dynamics model. Comput Methods Biomech Biomed Engin. 2015 Oct. 18 Suppl 1:1894-5. [Medline]. Krishnan K, Ge L, Haraldsson H, Hope MD, Saloner DA, Guccione JM, et al. Ascending thoracic aortic aneurysm wall stress analysis using patient-specific finite element modeling of in vivo magnetic resonance imaging†. Interact Cardiovasc Thorac Surg. 2015 Oct. 21 (4):471-80. [Medline]. Celi S, Berti S. Three-dimensional sensitivity assessment of thoracic aortic aneurysm wall stress: a probabilistic finite-element study. Eur J Cardiothorac Surg. 2014 Mar. 45 (3):467-75. [Medline]. Valente T, Rossi G, Lassandro F, Rea G, Marino M, Muto M, et al. MDCT evaluation of acute aortic syndrome (AAS). Br J Radiol. 2016. 89 (1061):20150825. [Medline]. [Full Text]. Lankipalli RS, Pellecchia M, Burke JF. Magnetic resonance angiography in the evaluation of aortic pseudoaneurysm. Heart. 2002 Feb. 87(2):157. [Medline]. Backes WH, Nijenhuis RJ, Mess WH, Wilmink FA, Schurink GW, Jacobs MJ. Magnetic resonance angiography of collateral blood supply to spinal cord in thoracic and thoracoabdominal aortic aneurysm patients. J Vasc Surg. 2008 Aug. 48(2):261-71. [Medline]. Corvera JS. Acute aortic syndrome. Ann Cardiothorac Surg. 2016 May. 5 (3):188-93. [Medline]. [Full Text]. Davies RR, Goldstein LJ, Coady MA, et al. Yearly rupture or dissection rates for thoracic aortic aneurysms: simple prediction based on size. Ann Thorac Surg. 2002 Jan. 73(1):17-27; discussion 27-8. [Medline]. Mendoza DD, Kochar M, Devereux RB, Basson CT, Min JK, Holmes K, et al. Impact of image analysis methodology on diagnostic and surgical classification of patients with thoracic aortic aneurysms. Ann Thorac Surg. 2011 Sep. 92(3):904-12. [Medline]. Gonzalez-Fajardo JA, Gutierrez V, San Roman JA, et al. Utility of intraoperative transesophageal echocardiography during endovascular stent-graft repair of acute thoracic aortic dissection. Ann Vasc Surg. 2002 May. 16(3):297-303. [Medline]. Scott CH, Keane MG, Ferrari VA. Echocardiographic evaluation of the thoracic aorta. Semin Roentgenol. 2001 Oct. 36(4):325-33. [Medline]. von Segesser LK, Marty B, Ruchat P, Bogen M, Gallino A. Routine use of intravascular ultrasound for endovascular aneurysm repair: angiography is not necessary. Eur J Vasc Endovasc Surg. 2002 Jun. 23 (6):537-42. [Medline]. Khoynezhad A, Kruse MJ, Donayre CE, White RA. Use of transcranial Doppler ultrasound in endovascular repair of a type B aortic dissection. Ann Thorac Surg. 2008 Jul. 86(1):289-91. [Medline]. Soulen MC. Catheter angiography of thoracic aortic aneurysms. Semin Roentgenol. 2001 Oct. 36(4):334-9. [Medline].